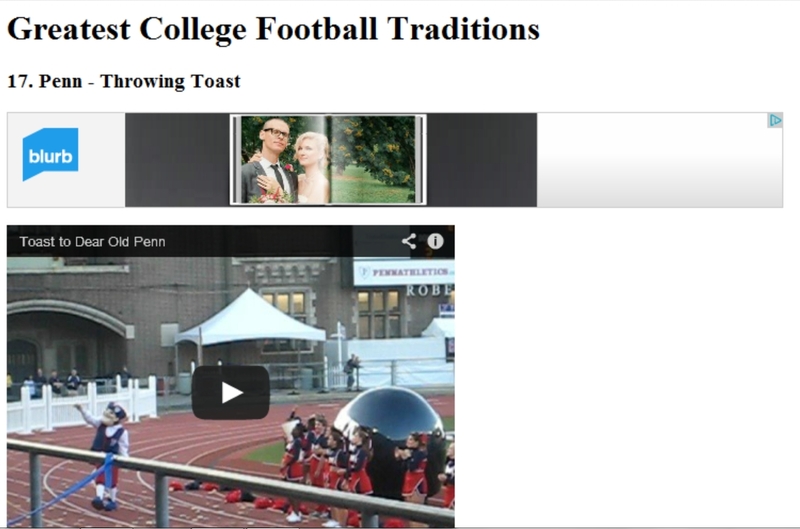 Penn fans throw toast onto Franklin Field after the third quarter of every home football game. The toast-throwing tradition — in response to the line "Here's a toast to dear old Penn" in the school song "Drink a Highball" — was inspired by antics at screenings of The Rocky Horror Picture Show. The act of throwing toast was adopted after alcohol was banned from the stadium in the 1970s. Students turned towards bread, and even bagels, so that they could continue to raise a "toast" to Penn. Did You Know... In a good season, 20,000 to 30,000 pieces of toast are thrown per game!